Become an EASYMILL reseller and increase your revenue. EASYMILL is the ultimate easy CAM solution. Help us grow ! 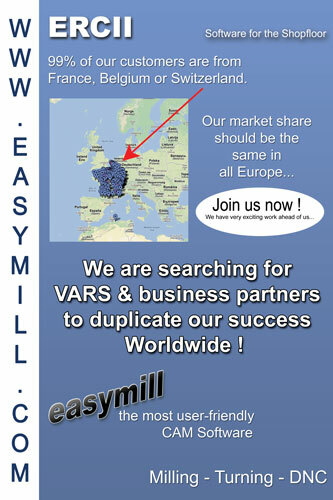 Join us and become an EASYMILL reseller! EASYMILL is an easy and affordable CAM software. Quick and easy to implement, EASYMILL can be used as soon as you download it. EASYMILL has powerful functions and is really cost-effective, even for very simple parts. It helps save time and money. EASYMILL produces ready to use error free programs in a few seconds. In 1980, Stéphan Hales develops his first CAM software. ERCII is founded in 1991. Since then, Stéphan distributes his easy CAM solution EASYMILL for mills and lathes with up to 5 axes, as well as e-DNC (a RS232 communication tool for simple PC to machine transfer) optimizing industrial processes in hundreds of companies. Why add EASYMILL to your catalogue? …Because EASYMILL is different…! Self training videos and tutorials are included; almost all our customers use EASYMILL without any expensive additional training! And above all a trial version of EASYMILL is available for downloading and free testing for a duration of 6 weeks before purchasing! For more information about the advantages of EASYMILL, click here! Today, 99% of our customers are from France, Belgium or Switzerland because our VAR's are in France... but our market share should be the same in all European countries so join us and help us grow ! Are you a CAM software VAR ? EASYMILL would be a great addition to your software catalogue ! Are you a CNC machine reseller (of new or used machines) ? EASYMILL adds value to all CNC machines for a low price ! Are you an enthousiastic CAD-CAM user ? Turn you hobby into a job. Become an EASYMILL reseller and increase your revenue! Special Training program available for our resellers : for instance pre-training live on-line demonstration of our software. In case any problems need to be sorted with regard technical aspects of our software, our Sales Technicians will be available to help you and your customers. More information about or our Reseller Program ?